The Third Judicial District Commission on Judicial Performance unanimously recommends by a vote of 10-0 that Judge Leslie J. Gerbracht BE RETAINED. Judge Gerbracht was appointed as District Court Judge in September 2006. 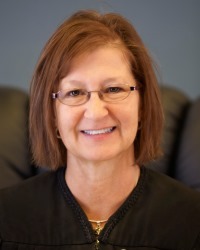 Judge Gerbracht received her Bachelor of Arts from the Sangamon State University in 1984 and her law degree from the Southern Illinois University Law School in 1997. Prior to her judicial appointment Judge Gerbracht worked in Trinidad and Walsenburg as a public defender and later a private attorney. Judge Gerbracht has demonstrated her strong commitment to Las Animas and Huerfano Counties through her judicial and community service activities. She is President of the Board of Directors of the Trinidad State Junior College Educational Foundation, chairs the Trinidad Access to Justice Committee and started a non-profit for the benefit of children in the justice system. Judge Gerbracht has initiated successful problem-solving court programs which include her Truancy Prevention Program, GED Completion Program and Family Drug Court Program. In 2012 Leslie Gerbracht was named the “Citizen of the Year” by the Trinidad Community Foundation. Prior to reaching its recommendation to retain Judge Gerbracht, the Commission conducted a personal interview with Judge Gerbracht, reviewed Judge Gerbracht’s judicial opinions, made courtroom observations in Las Animas and Huerfano Counties, met with Chief Judge Claude Appel and reviewed survey responses sent to local attorneys, local non-attorneys and judges on the Colorado Court of Appeals. The Commission noted that few local attorneys participated in the survey. Completed surveys indicated that 67% of local attorneys recommended to retain, 20% recommended do not retain and 13% made no recommendation. Of non-attorneys completing the survey 86% recommended to retain and 13% made no recommendation. Judge Gerbracht presides over criminal, juvenile, probate, dependency and neglect, domestic relations and civil matters in primarily Las Animas County. She also presides over a small number of cases in Huerfano County approximately once a month. The Commission noted several exemplary traits in Judge Gerbracht that led to the Commission’s unanimous recommendation to retain. These include her intellect and passion for her work as a jurist; her significant contributions both in court and out regarding improving the lives and education of local children; her patience, empathy and demeanor with unrepresented individuals; her commitment to consistent fair treatment of criminal defendants and her integrity in dealing with challenges unique to the Third Judicial District. The Commission found Judge Gerbracht genuinely receptive to suggested areas of improvement which included creating greater public awareness of her successful problem-solving courts, becoming more time efficient in case management and increasing her presence and availability in Huerfano County. The Commission found significant strengths and no apparent weaknesses in Judge Gerbracht’s ability as a judicial officer.